Camp Pike Park was a baseball park located at Camp Pike in North Little Rock, AR. The park was the part-time home of the Little Rock Travelers between 1918-1919. Several MLB exhibitions games were also played at the park in 1918. The ballpark was located near what is now the intersection of Louisiana Avenue and Camp Robinson Road at Camp Robinson in North Little Rock, AR. It's not entirely clear what the name of the ballpark was. Generally, the Arkansas Gazette just referred to it as "the Camp Pike park" or "the Camp Pike field". On July 21st, 1919, the Gazette did however refer to the park as "Miller Field". Contradictory to that, the Kansas City Star on November 11th, 1918, referred to the park as "Belmont Field Park"(1). For clarification purposes here, the ballpark will be referred to as "Camp Pike Park". Robert Allen, president of the Little Rock Travelers, announced plans to build a baseball park at Camp Pike in February 1918. Allen’s motivations to build what would become Camp Pike Park were reportedly “inspired by a desire to play before soldier crowds”. There were other motivations too, of course. Local law prohibited playing league games on Sundays, but Allen planned to circumvent this law by playing on government property at Camp Pike. There, he believed, his team could play without the State intervening. His reasoning may or may not have been legally sound, but the plan, backed by his reportedly good intentions, received support from Camp Pike officials and Little Rock citizens. Building a new ballpark, though, was seemingly a financial gamble. After all, a relatively few games would be played there. The Arkansas Gazette reported that Allen hoped to merely break even on the endeavor. But perhaps Allen knew better. At a time when World War I had drastically decreased attendance, the prospect of several thousand paying soldiers must have made the gamble worthwhile. Little Rock was averaging less than 1,000 a game at their home park, Kavanaugh Field. But at Camp Pike, that attendance could easily be at least tripled. Thus, construction on Camp Pike Park began in March 1918. Hundreds, if not thousands, of soldiers pitched in to complete the work at the site chosen for the project. President Allen arranged for exhibition games to be played at the new ballpark by the end of month, and the goal quickly became to build a ballpark as large as possible as quickly as possible. By mid March, the field had been graded and the infield sodded. Meanwhile, a pavilion and bleachers were erected. As work on the grandstand progressed in a rapid fury, the capacity of the ballpark increased from 1,000, to 2,500, to more than 5,000 in a matter of two weeks. Not even spring showers hindered construction. Rather, rain to loosen up the ground was met with optimism. Construction continued despite the weather, and by the grand opening set for Saturday, March 23rd, Camp Pike Park was ready for games. 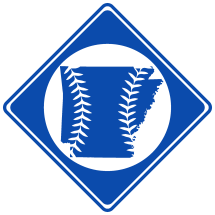 The Brooklyn Robins and the Boston Red Sox, two major league teams training 50 miles southwest in Hot Springs, AR, were booked to open a 5-game series of exhibition games at the new ballpark. Festivities were finalized, and several thousand soldiers anxiously awaited the opportunity to see the big league clubs in action. Unfortunately, as the day of the grand opening came, the sky began to gray. Shortly after the two teams arrived at the ballpark, it again began to rain. After a 30-minute downpour, the precipitation ceased, and both teams took the field. But before the game could start, a second round of rain began and erased any chance of playing. The disappointed soldiers who attempted to wait out the rain were told to come back tomorrow when all would be tried again. The opening had not been a total failure though. Batting practice had ensued during the brief moments of sunshine and Boston’s Babe Ruth proceeded to put on a show of power. At a time when homeruns were relatively rare, Ruth gave the soldiers something to cheer about, knocking 5 baseballs over the right field fence. The crowd appealed for more, but Red Sox’ manager Ed Barrow put a stop to the show, citing the high cost of baseballs lost during the excitement. The next day, the Arkansas Gazette attempted to make light of the rainout, stating that the real cause of the rain was a black cat that crossed the path of the Robert Allen Jr. A piece also ran in the New York Times describing the success and misfortunes of the previous day’s events at Camp Pike. The author marveled over the completion of Camp Pike Park, noting the ballpark had “been completed in a record time of fifteen days to be ready for the game”. The piece also mentioned that the main lineups of Boston and Brooklyn had returned to Hot Springs and would not be present to play at Camp Pike that afternoon. Instead, only a collection of lesser second teams remained to try re-opening Camp Pike Park. However, such news either failed to reach Camp Pike or otherwise failed to discourage a large crowd from assembling at Camp Pike Park. By game time Sunday, 6,000 generals, majors and privates alike packed into the ballpark to watch the first real game at Camp Pike. As far as baseball games go though, it was less than exciting. An 18-8 blowout by Boston resulted, but the score was of little concern to the soldier fans that were pleased with the afternoon of entertainment. There were those of course that were not happy with the lack of skill displayed by the two clubs, and to those, president Robert Allen apologized and assured that Boston and Brooklyn’s regulars starters would appear at Camp Pike Park on Wednesday the 27th. Indeed, the second game played at Camp Pike featured a pitching duel between Hall of Famers Babe Ruth and Burleigh Grimes. Meanwhile, Boston’s star right fielder Harry Hooper doubled and stole a base. Overall, a fantastic, snappy game was played, taking only an hour and 25 minutes to complete. In the end, Brooklyn won by a score of 3-2, but few were there to appreciate the victory. Many soldiers, disgruntled with the rainout and poorly played opener, seemingly chose to stay away. Nevertheless, the series continued on Saturday, March 30th with perhaps the best game yet. Babe Ruth not only homered in the 8th, but drove home the winning run with a walk-off single in the bottom of the 9th, giving Boston a 4-3 victory. The Red Sox’ luck continued the next day as the series at Camp Pike wrapped-up. Down by a run in the top of the 9th, Boston answered with 5 runs, winning 7-4. The two clubs soon moved on to Texas to play more games, but Camp Pike Park wasn’t quite done with big league exhibitions just yet. On April 10th, the Detroit Tigers and the Cincinnati Reds appeared at Camp Pike. By then, soldiers at the camp were again enthusiastic about the opportunity to watch a good game, and 2,000 of them showed up to see Ty Cobb and the Tigers gain victory, 5-3. Amidst the enthusiasm though, Camp Pike Park’s intended purpose as a part-time home of Robert’s Allen’s Little Rock Travelers was not lost. During April, the Travelers prepared for the upcoming season at the ballpark by practicing against soldier teams. These teams were comprised mostly of former professionals stationed at Camp Pike during the war. The practice must have done the Travelers well, for shortly after the season opened on April 19th, the team rose to the top of the league standings. The club’s 7th game of the year on Wednesday the 24th was the first officially played at Camp Pike Park. Little Rock took on the Nashville Volunteers and won by a score of 6-5. Four days later, the Travelers returned to Camp Pike. It was the first Southern Association game played on Sunday in Little Rock since the team had entered the league three years prior. The Chattanooga Lookouts were on hand to witness the event, as well as to defeat the Little Rock club 5-9. As the season progressed, three more games were played at Camp Pike, each drawing a good crowd. The Travelers fared well, winning 41 out of 69 games before the Southern League decided to officially discontinue the season in late June on account of the War. Little Rock finished second in the final standings behind New Orleans. The Travelers did not return to Camp Pike again that season, but baseball games continued at Camp Pike Park nonetheless. In September, Camp Pike played Camp Funston, winning twice. That same month, a large number of those at Camp Pike went to war, as the 87th Division was sent overseas. Fortunately, the War ended in November. In Little Rock, however, a long-standing battle of a different kind was being fought. In the spring of 1919, a group of Little Rock ministers sent an official protest against the act of playing baseball on Sundays at Camp Pike to General Peter Traub. The general, unsure what to do, forwarded the protest to Washington, where the matter sat in the hands of the War Department for several months. The Travelers opened the 1919 season and played five Sunday games at the camp before a decision on the protest was made. On July 22nd, the War Department ordered for Sunday games at Camp Pike to cease. The ruling was a major blow to the Little Rock club who had 7 more Sunday home games on the schedule. All of those games would now have to be played as a double-header at Kavanaugh Field on Saturday or played in Memphis. The Travelers did not return to Camp Pike Park after the order was issued. It’s unclear what happened to the park following the 1919 season. Five MLB exhibitions were played at Camp Pike in 1918. Between these five games, eight different Hall of Famers appeared at Camp Pike, including Babe Ruth and Ty Cobb. Note: Game was rained out; Babe Ruth hit five homeruns in batting practice. Note: Hall of Famer Burleigh Grimes participated in this game. Note: Hall of Famers Harry Hooper, Johnny Evers, Babe Ruth, and Burleigh Grimes participated in this game. Note: Hall of Famers Rube Marquard, Johnny Evers, Babe Ruth and Harry Hooper participated in this game. Note: Hall of Famers Johnny Evers, Babe Ruth and Burleigh Grimes participated in this game. Notes: Hall of Famers Edd Roush, Harry Heilmann and Ty Cobb Participated in this game. Note: Winner was Camp Pike.